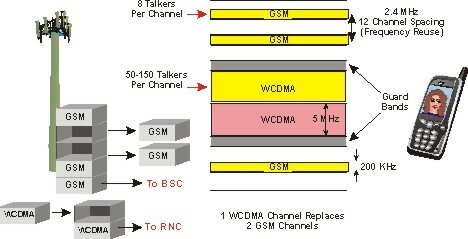 This figure shows a simplified diagram of a WCDMA system. 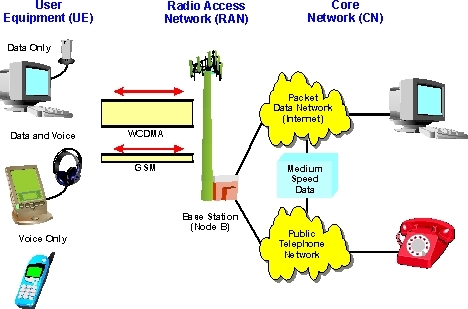 This diagram shows that the WCDMA system includes various types of mobile communication devices (called user equipment - UE) that communicate through base stations (node B) and a mobile switching center (MSC) or data routing networks to connect to other mobile telephones, public telephones, or to the Internet via a core network (CN). This diagram shows that the WCDMA system is compatible with both the 5 MHz wide WCDMA radio channel and the narrow 200 kHz GSM channels. This example also shows that the core network is essentially divided between voice systems (circuit switching) and packet data (packet switching). This figure shows the basic soft handoff process that occurs in the IS-95 CDMA system. In this example, the mobile device has measured the signal strength of the pilot channel from a nearby cell site. Using this information, it is determined that the adjacent cell site is a candidate for the soft handoff process and that is should simultaneously communicate with the mobile device and the soft handoff process begins. During the soft handoff process, information from the mobile device is simultaneously received by both cell sites and the information frames that have the highest quality (least errors) can be selected. 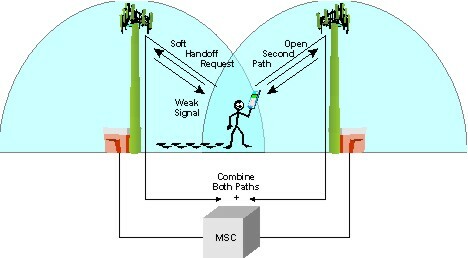 This figure shows how a GSM system can be upgraded to offer WCDMA services. This diagram shows that 2 or more GSM channels are typically removed, replaced, or upgraded to have WCDMA modulation and transmission capability.